The Best Alternative To Replacement Vinyl Fence Panels, Posts and Parts! Your vinyl fence will look as good as new! Having to take apart a vinyl fence to repair broken sections can feel like a huge waste time, money and effort for most homeowners. Fence repair might include having to dig and remove cemented fence posts, having to dis-assemble and re-assemble fence parts, and might require a homeowner to track down and order fence parts that might not be manufactured anymore. In many situations homeowners don't have the time or patience to deal with this kind of hassle. Instead many homeowners choose to hire and many times unknowingly overpay fence contractors to do these small pain in the neck jobs for them, simply because they don't have the time to hunt for parts themselves. Most often the case is that homeowners could easily do these small fence repairs themselves whether they are handy or not. Removing and replacing broken plastic/vinyl fence panels, slats, posts, rails and pickets can take hours to accomplish and might also take weeks to order the correct parts/colors. Fence parts can many times even stop being produced by manufactures and might be extremely hard to impossible to find. Additionally some fence parts might not be manufactured anymore in those colors by some manufacturers. No-one wants to wait weeks to get the replacement parts they need to fix the fence. especially when a homeowner has the time to do the repair now. It can be even more of a hassle when a homeowner finally gets all the fence parts and begins to put them back together again after weeks of waiting while trying to remember how it all goes back together again. It can be even more frustrating for Do it Yourselfer's (DIY) to find they have ordered the wrong colored parts or fence pieces altogether. The Vinyl Fence Repair Kit was created with the DIYer in mind. We created our kits so the average homeowner can do a fence repair in minutes. The intimidating broken vinyl fence no longer takes days of works, phone calls and hassle but minutes and all without having to take apart the fence. It can fix multiple fence areas and does not require any painting whatsoever. The Vinyl Fence Repair Kit uses strong UV stable composites to repair your fence so well you wont even be able to tell the hole was even there. Our Vinyl Fence Repair Kit is less wasteful to our environment because it reduces the total space taken up by fences in our landfills. Additionally most vinyl fences can be restored to original condition and can be repaired with little hassle. We repair everything else why not our vinyl fence? The Vinyl Fence Repair Kit is so easy to use that anyone that can read can easily use the directions to do a professional fence repair. The fence kit's UV stable colors will match your vinyl fence's original manufacture color based on our spectrum color matched fence compound and it requires no painting or long-term upkeep just like the original fence! "Our Vinyl Fence Repair Kit Works So Well You Wont Be Able To Tell The Fence Has Been Repaired!" "AVERAGE VINYL FENCE REPAIR COST RANGE FROM $263-$701 ON A SMALLER REPAIR PROJECTS (6 ft fence section and less)"
According to Home-Adviser the average cost that home owners spent for vinyl fence repair range from $263-$701 on a repair project for smaller less time consuming repairs. The average homeowner can expect to pay at least this amount to fix and or repair broken vinyl fence sections and or to remove and replace vinyl fence posts, or to service other vinyl fence issues including fence panel holes. Some cases these job estimates do not include additional trip fees that also might be added onto the end bill. 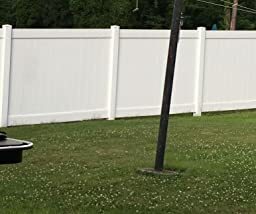 The truth is that most vinyl fence contractors charge a premium to do these fence repair services because they don't want to waste their time traveling to do these small vinyl fence repair jobs when they could be making more money on larger jobs! This is why it is typically several times more expensive to have a fence repaired by a contractor than it is to (DIY) do it yourself. The trouble is that even with DIY fence part replacement projects it can takes weeks to get parts ordered as mentioned above. Many home-owners are looking for alternatives like our Vinyl Fence Repair Kit to save time, money and hassle. We put together The DIY Vinyl Fence Repair Kit so contractors don't have to do the repair work and so homeowners have other options and are not overcharged! You don't need to call a fence repairman that is out of your price range or start taking apart the fence. Buy a Vinyl Fence Repair Kit and move on with your to do list! Save $ On Your Next Repair With Fence Daddy! Works great! Much better than replacing a whole panel. Super easy to use and worked very well. No need to pay someone to do the work! Great product, saves money when just a small repair is needed for vinyl fencing! I have used this product twice. Second time was when my son threw a baseball thru our new fence. Love it!! The thought of having to replace the several panels made me ill until I found this product. Thanks for this useful product, which I'm looking forward to using soon. I watched the video on YouTube, and the directions look easy to follow. The best thing is saving money on materials and labor, by not having to replace an entire vinyl panel. I didn't see any other product on the market like yours, and I'm glad to know about it. Thanks! it, and you will be glad you didn't have to replace entire panels for nearly $100 apiece.